and assist in meeting the Emergency Preparedness Requirements for Medicare and Medicaid Participating Providers. DMS-06111 Evac123® Skilled Nursing Facility Evacuation 60 Package Applicable to NHICS facilities. Track the evacuation of up to 60 patients 60 - Evac123 Evacuation Tags (DMS-05854) 3 - Evac123 Room Evacuation Storage Clipboards 6 - Evac123 Room Evacuation Receipt Holders (DMS-05855 ..
DMS-06112 Evac123® Skilled Nursing Facility Evacuation 100 Package (SNF) Applicable to NHICS facilities. Track the evacuation of up to 100 patients 100 - Evac123 Evacuation Tags (DMS-05854) 5 - Evac123 Room Evacuation Storage Clipboards 10 - Evac123 Room Evacuation Receipt Hol..
DMS-05857 Evac123® Skilled Nursing Facility Evacuation 200 Package (SNF) Applicable to NHICS facilities. Track the evacuation of up to 200 patients 200 - Evac123 Evacuation Tags (DMS-05854) 10 - Evac123 Room Evacuation Storage Clipboards 20 - Evac123 Room Evacuation Receipt Ho..
Evac123® Room Evacuation 1 Package Applicable to NHICS facilities . Component 1 of the 3 components of the Evac123® Skilled Nursing Facility Evacuation System is Room Evacuation. The Evac123™ system integrates your facility's plan for patient evacuation and tracking with your pat..
DMS-05860 Evac123® Transportation Step 2 Package Skilled Nursing Facility (SNF) Applicable to NHICS facilities . Component 2 of the 3 component Evac123® Skilled Nursing Facility Evacuation System is HICS 255 Staging and Transportation. The Evac123™ System was developed by Di..
DMS-05861 Evac123® Destination Step 3 Package Applicable to NHICS facilities. Component 3 of the 3 component Evac123® Skilled Nursing Facility Evacuation System is Destination. The Evac123™ System was developed by Disaster Management Systems in close coordination with Skilled Nursing..
DMS-06115 Staff T-Card System Fulfills the CMS Staff Tracking Requirement! Reliably Track Your Staff During Emergency Events. Works When the Power Doesn't! Easily and reliably manage all aspects of staff tracking with this self-contained mobile accountability system. 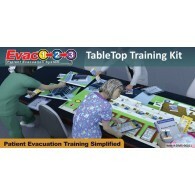 Based off the proven T-Ca..
DMS-06011 - Evac123® Tabletop Training Kit for Skilled Nursing Facility Evacuation NHICS CMS Compliant Patient Accountability from DMS. Skilled Nursing Facility evacuation using our large tabletop map excercise is now simplified. No need to shut down a wing of your facility for drills in order t..
DMS-06124 Staff T-Cards/T-Card Holders Refill for DMS-06115 Staff T-Card System Includes: 80 - DMS-06114 T-Cards (5 perforated synthetic card sheets yielding 16 T-Cards each) 1 - Pack of 4, DMS-06113 T-Card Holders (synthetic card pocketed holder holds up to 20 T-Cards each) Click to View D..
DMS-05855 Evac123® Room Evacuation Step 1 Receipt Holder Refill (SNF) Applicable to NHICS facilities. These Waterproof Synthetic Card Evac123® Skilled Nursing Facility Step 1 Room Evacuation Receipt Holders utilize specially designed clear vinyl pockets to hold "Room Evacuated 1" receipts..
DMS-05858 Evac123® HICS 255 Transportation Step 2 Receipt Holder Refill (SNF) Applicable to NHICS facilities . These Waterproof Synthetic Card Evac123® Skilled Nursing Facility Step 2 HICS 255 Transportation Receipt Holders for Staging/Transportation operations utilize specially designed..
DMS-05859 Evac123® Destination Step 3 Receipt Holder Refill Applicable to NHICS facilities . These Waterproof Synthetic Card Evac123® Skilled Nursing Facility Step 3 Destination Receipt Holders utilize specially designed clear vinyl pockets to hold "Destination 3" receipts for up to 10 pat..
DMS-05854 Evac123 Skilled Nursing Facility NHICS Evacuation Evacuee Tag NHICS CMS Compliant Patient Accountability from DMS. The DMS-05854 Evac123 NHICS Skilled Nursing Facility Evacuation Evacuee Tag is an integral part of the new Evac123 Modular Evacuation System from DMS. 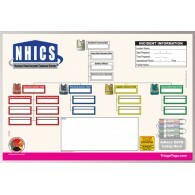 NHICS Compliant,..